Whether you own an existing business or have an idea for a startup, you need a strong online presence. Usually, the first thing your potential customer will do when searching out your product or service is to conduct a web search, and if your website is relatively easy to find and navigate, you’ll greatly increase your chances of a sale. With the majority of shopping happening on the internet, the dynamic of marketing has changed significantly, and one of the most effective and lasting methods of reaching potential customers is through a well-developed and maintained website. From a marketing standpoint, you can create a lasting brand image with the right domain name. Online success starts with a great domain. Get yours today at Domain.com. Deciding and registering a domain name should not be done in haste. It is a valuable marketing and search tool that should successfully lead customers to your site. Careful deliberation and research should be applied, as it might be the most important decision you make when carving out your slice of the online market. Adds professional credibility to your business and separates you from the millions of get-rich-quick-scheme websites out there. Provides visibility for your brand. Much like a storefront window, a good domain will create awareness and attract customers. Establishes your business as tech-savvy and forward-thinking. Whether you actually sell products online or not, it is crucial to your reputation to claim your territory online. Creates mobility for your internet presence. If you decide to change web hosting services, relocate to a different country, or shift to using your own in-house server, your domain name stays with you, allowing you to continue to build your brand without having to start all over. Increases your search engine ranking. As you build your business and develop your website with quality content, your domain name will become more and more recognizable in search engines like Google, which draws more customers in your direction. Will provide your brand with marketability around the world, or you can choose to focus specifically in a local region. As opposed to traditional marketing—as long as you keep current with the low annual fees—your domain name will not expire. Your brand says everything about you, your values, your identity, and what you promise to deliver. Why should your domain name be any different? Before choosing one, it’s important that you educate yourself on the different styles and types of domain names out there so you can make the best decision for your needs. A new startup business should select a domain name that parallels—or even better, matches—the company name to direct customers to your site without any confusion. This is a great opportunity to choose a name for your business that is unique and available as a domain before announcing yourself to the world. If you already own an existing business and your company name or certain keywords you wish to use are not available, a little creativity might be needed to select a domain name. We’ll get into that later in this article. It is always better to have a domain name that is short and easy to remember. Ideally, the length should be between 6-10 letters, with 8 being the sweet spot. Simple, concise, and typeable should be the rule over longer, more descriptive names. The longer the domain, the more opportunity there is for a misspelling when typing. Also, when combining words in a domain, beware of letters that don’t normally link together or are confusing, like expertsexchange.com for the site Experts Exchange. Not ideal. Avoid using hyphens and numbers as they can complicate and frustrate users. Always remember: simple is best. Keywords are words related to the product or service used in a domain name. For instance, best-vacuum-cleaners.com. This is also known as an Exact Match Domain (EMD). However, using keywords in a domain isn’t always bad. From a marketing standpoint, you know exactly what they sell at best-vacuum-cleaners.com, but beware that you could be looked upon as a spam. This could negatively affect your Google ranking. You are much better off creating a strong brand image and backing it up with useful and original web content to foster a trusted online presence. gTLDs and nTLDs are the extensions within your domain name. Far and away the most popular and most effective TLD is .com. It is universally recognizable, easy to remember, and most trusted by web surfers. Some TLDs have certain restrictions associated with them. For instance, .biz, .name, and .pro are only assigned to credentialed professionals or businesses. Sponsored TLDs are overseen by a sponsor who establishes the rules of eligibility for the specified community. These nTLDs can be very useful to create a domain name that quickly and creatively describes your brand or industry. The possibilities are seemingly endless, but now is the time to capitalize on a creative extension since, as with .com, they won’t be available forever. A country-specific TLD can be useful if you conduct your business within a certain country. If you have a moving company in London, for instance, a domain name like bigbenmovers.uk will prompt Google to target searches locally in the U.K. directly to your site. A ccTLD narrows the focus of your business to a geo-specific region. For the most part, a .com address is ideal, but if your desired domain name is not available, don’t despair. Your dream domain might still be available, but it will probably cost you. A current operating business may be using the domain, but oftentimes, domains are purchased and never used, the company has gone out of business, or the domain was snatched up as an investment and is for sale. These are known as Premium Domains. 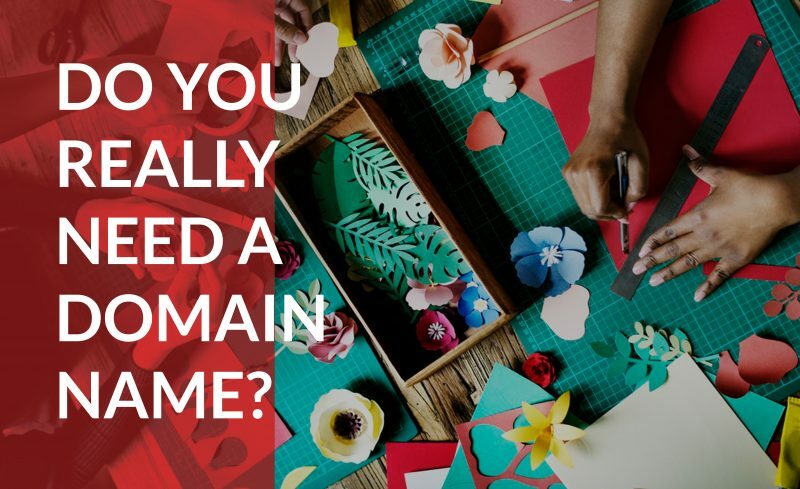 If you are convinced that your business must have a certain unavailable domain name to succeed, investing in a premium domain name upfront could pay off in the long run. Simple, short, and sweet: Since just about all of the common words and phrases are already registered as a domain, going premium might be your only hope to brand your company using a succinct or catchy domain name. Credibility: A highly valued domain will instantly thrust your site into the realm of the top players in your industry, and establish trust with the public that could otherwise take years to develop. Attract more commerce: With a simple and direct premium domain name, such as petinsurance.com (taken by Nationwide Insurance) or visitparis.com, people looking for your product or service can bypass a Google search and simply type the address into the search bar and be sent directly to your site. Highly esteemed: Most premium domains have been around for a long time, and have accrued a ton of backlinks, which drive consumers with referrals from other sites to your own. This also has a big impact on the site’s SEO ranking. A solid investment: If your business grows like you hope it will, the value of your premium domain name will also increase. Therefore, it becomes a very desirable asset if you choose to sell it down the road. The cost of a premium domain name will vary based on several factors, but consider taking a long-term view on its value when formulating your brand. There are many professional investors who specialize in premium domain names and will resell them later when their value increases. If you see an opportunity to capitalize on the perfect domain name, or several, this could be your chance to start investing. After all, some domain names have skyrocketed in value over the years because of their simplicity, credibility, backlinks, and other valuable advantages. If you think that’s something, consider that the domain name cars.com was valued at a staggering $872 million when the company was sold for a total of $2.5 billion just a couple of years ago. So, if you have an inkling for the next up-and-coming domain name, jump on it before someone else does! If your business is not in a place to take on the expense of a premium domain name or if your domain name is already taken, there are many other options you can consider. Choose a slightly alternate version or an abbreviated version of your desired name. Get creative, but don’t settle for too long a name or anything that could be confusing or unrelated to your business or brand. Use a different domain extension. According to Google, there is no preference given to .com addresses over any other extension. If your business reflects a certain nTLD and will create a memorable web address, go for it! Use a slogan instead of the company name. As long as it’s succinct, recognizable, and will reflect your brand, this could be a good way to generate marketing. A strong domain name is important for any size business, at any stage of development. It will entice consumers with a snappy slogan or unique title, it should promote a sense of professionalism and satisfaction, and it should separate your business from others in your industry. Think of it like you’re deciding on a company logo, because the two should go hand-in-hand. Your domain name must be a reflection of your brand, simple, and memorable.